Morning you guys! So I guess you've already read the title and seen the picture below, and you've probably smiled at the fact that I'm all decked out in wedding garb.haha I figured though that with wedding season being in full swing, and the fact that wedding and prom tutorials are the more frequently requested types of tutorials, that this month's hairstyle week had better be focused in that direction! What do you think? do I pull off the bride look okay? haha In all seriousness though this style is so fast and easy, and is such a classic and timeless look for a wedding, a prom, a night out with the ladies. I know that when I've styled ladies hair for weddings and proms especially, they want something that is a mix between up and down that way they get the best of both worlds, and this definitely fits the bill! So now that I've talked a bit about the tutorial and why I chose to share it today, lets get to the actual directions! Steps 1-3: Start by combing through your hair till it's smooth. If you have thin hair (like me:)) now would be a great time to tease your hair a bit at the back of your crown for some good lift and volume. clip up the top two thirds of your hair and (1) start curling the bottom third in large chunks with whatever hot tool you prefer:) (2) Pin up each curl as you complete it so it can set. Move on to curl the second third, and the last third, remembering to curl all the hair framing your face away from your face. Combing each section of hair before you wrap it around the iron will ensure a silkier curl. Once your whole head is pinned up (should only have a dozen or so curls) (3) give your head a spritz with hair spray. Steps 4-6: Once your curls have cooled (a couple minutes), (4) let them all out and spray again. divide your head into rough thirds again (5) this time going vertical and leaving out the front. so you're going to have a left section and a right section that meet at the back and the front, with a very rough sort of circle of hair in the middle. (Hope that makes sense!) Grab a 2-3 inch chunk of hair right from the back of your middle section and (6) braid it, securing the end, and tugging the sides to widen the braid and give it fullness. Steps 7-9: Take the rest of your middle section and (7) tie it in a low ponytail, tug the hair at your crown. Wrap the braid around your head (covering the part) and pin it securely. (8) Twist your side sections one at a time towards your head slightly and (9) wrap them both over the ponytail, pinning on the opposite side. Fluff your curls a bit, spray with some good hold, and you're all set to go!!! And that's it. It's definitely one of those styles that looks much more complex to do than it really is, while still looking effortless and easy. Even with my long hair it took me less than 15 minutes and half of that was in the curling! haha Also if you didn't need your curls to last extra long you wouldn't need to clip them up like I do, to set, which would shave off even more prep time! Looks beautiful and makes me miss the fact that I had extremely long thick hair a year ago until I bleached it and lost half of it. In two more years it will be back though. 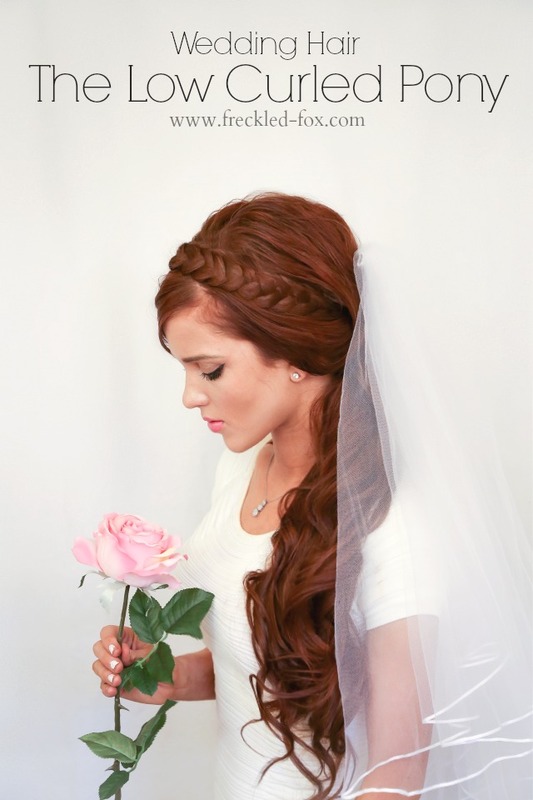 This hairstyle is so beautiful and makes me want to get married again. My 10 year anniversary is in June, but no money for renewal celebration. Oh well. Maybe I'll do something. You are gorgeous by the way. That is so beautiful! You always have the best hair tutorials. Beautiful! 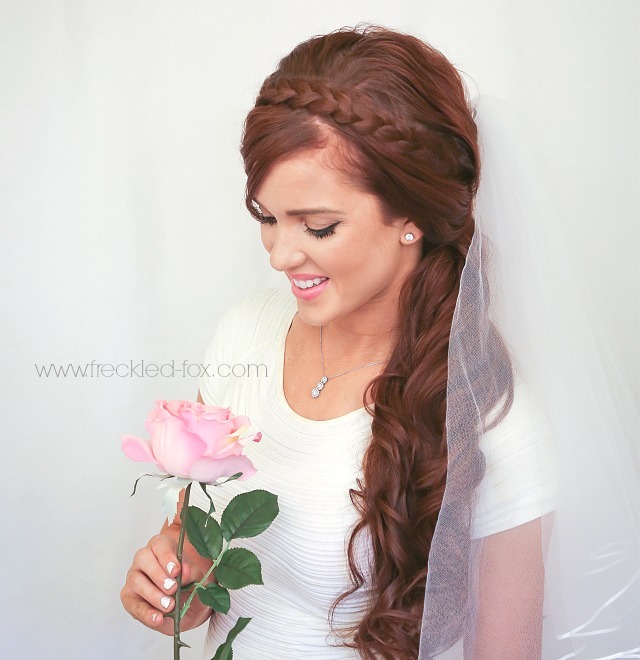 Wish my hair had turned out this great on my wedding day, haha! This look is absolutely gorgeous! I really love the style! nice art..you are looking so beautiful with your roll hairs.. So pretty! What does it mean though when you say that you should curl the hair before you wrap it around the iron? I absolutely adore your hair. Oh, I love this! So pretty!! Emily, oh my goodness, you look stunning! As a future wedding planner (and heck, as a female! haha) I got so excited to see that you did a wedding hair series. About to go drool over all the rest. I really need to stop getting behind, look at the awesome stuff I miss out on!